Recently, Syrian rebels (under EU embargo until mid-2013) have relied on weapons smuggled from neighboring states including Iraq, Lebanon, and Turkey (source). Image from commons.wikimedia.org. Why do arms embargoes fail? Despite their frequent use by international organizations like the United Nations and the European Union, arms embargoes suffer from a poor record of success. For half a century now, multilateral arms embargoes have been the primary tool used to fight the proliferation of small arms and light weapons (SALW) to conflict zones and perpetrators of mass violence. These agreements between countries prohibit the sale of weapons to a particular target country (or sometimes a target organization). However, official reviews and academic studies alike tend to conclude that small arms are still making their way to embargoed actors. Black markets are often cited as a source of this failure. Still, no large-n studies have presented evidence of increased black market activity in the presence of embargoes. To remedy this, I look for evidence of black market activity in records of legal arms trades. The data reveal that arms embargoes are associated with a substantial increase in the value of arms imports into nearby states. Given previous research on the nature of black market arms trade, this seems likely to result from an incentive for neighboring states to import more weapons that will then be transferred illegally to the embargoed state. Black market arms transfers are difficult to study. Most of what we know about illicit arms transfers comes from those cases where somebody has made a mistake and the illicit activity has been uncovered. Apart from those few select cases, reliable data on actual illegal arms transfers is unavailable. Nonetheless, the illicit arms trade is big business, measuring roughly one billion USD per year. Embargoed states and their neighbors. Embargoes based on data from Erickson (2013), Journal of Peace Research. Black markets are of particular concern in situations where the legal supply of weapons is low but the demand is high. These circumstances often apply to criminal organizations, rebel groups, and embargoed states. While these illicit trades are difficult to collect data on systematically, most of the weapons involved begin as legally-traded arms. They are traded legally and then diverted from their authorized recipients. Arms embargoes provide an interesting case for the study of illicit arms. Those countries that border embargoed states can take advantage of their shared border to traffic illegal arms to the embargoed neighbor without fear of discovery by a third party. Therefore, if embargoed countries circumvent those embargoes by purchasing arms illicitly, we should expect to see an increase in the arms imported to their neighbors. I have used data on multilateral arms embargos and legal arms transfers to test this proposition. 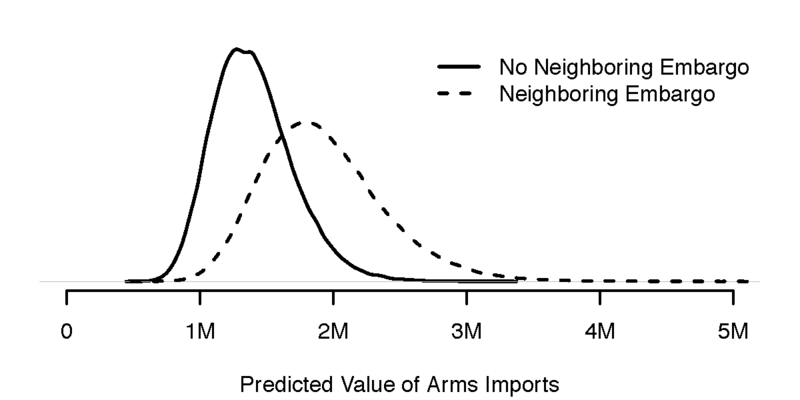 Statistical models reveal that arms embargoes are indeed associated with greater levels of weapons imports in nearby countries. In fact, the predicted increase is substantial: those countries that border embargoed countries are estimated to import 38% more arms than they would have had they not been neighboring an embargoed country (measured in value, constant 2000 USD). This can translate into hundreds of thousands or even millions of dollars worth of additional weapons. Furthermore, this result takes into account both domestic and international conflict as well as other predictors of arms imports like the overall level of arms imports to the region, government type, and GDP per capita. On the other hand, this analysis indicates that arms embargoes are indeed effective at stemming the flow of legal arms into embargoed countries. Countries targeted by an embargo are predicted to import, on average, 63% fewer arms than they would otherwise. Predicted levels of arms imports for a hypothetical median state bordering an embargoed state and not bordering an embargoed state. Fixed effect uncertainty included. Based on 100,000 simulations. Arms embargoes appear to effectively decrease the legal, or recorded, sale of arms to target states. However, this effect is accompanied by a significant increase in the level of arms imported to the surrounding region. 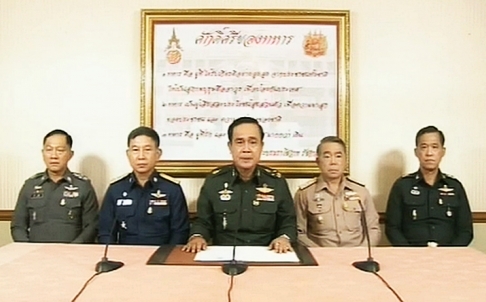 Absent other possible explanations, it seems likely that many of these arms are destined for the embargoed country. Effective arms control measures must account for the regional conditions that may undermine nonproliferation efforts. Large-scale event data based on worldwide media reports already help us to explain and forecast crises events such as civil wars or insurgencies. But the millions of data points provided by ICEWS or GDELT are a treasure trove for social scientists interested in all kinds of topics, whether they involve violence or not. For example, they can be used to look at the way politicians interact with each other. A lot of research on political competition in the past two or three decades has focused on party positions and politicians’ ideological leanings, fueled by the convenient availability of suitable data (i.e. NOMINATE and the Comparative Manifestos Project). But political competition is about more than just ideology and policy positions. Recent contributions on the Monkey Cage (here and here) have pointed out that the discussion about polarization in the US is to a significant degree about the way politicians interact with each other: that they are more interested in attacking each other verbally, rather than “getting things done” for the good of the country. Arguably, this kind of behavior is responsible for at least part of the gridlock and lack of legislative productivity in Washington even in areas where there is significant bipartisan consensus about policy. However, serious empirical investigations into the way politicians interact with each other have been largely absent, the main reason being a lack of suitable data. But the availability of large-scale media event data can help to change that. The machine-coded media stories that make up the ICEWS (or GDELT) data provide fine-grained information about how politicians publicly interact with each other, and with other societal actors. They record when one politician criticizes or denounces someone, and they also document when two actors praise each other or express a desire to work together. This allows us to analyze conflict and cooperation between political actors in a systematic manner. In a new working paper, I use the ICEWS event data to analyze the way parties interacted in the 11 Eurozone countries between 2001 and 2011. I divide the events into two categories, cooperative (e.g. one actor praises another) and conflictual (e.g. one actor criticized another), based on the CAMEO codebook. For each country, the data provide between 2000 and 30,000 events, involving between 125 and almost 450 actors (parties, NGOs, military, etc.). The actors have a complex network of interactions with each other. To summarize them in a simple and intuitive manner, I estimate latent network models for each country-year. Without getting into the technical details, these models estimate the position of each actor in a hypothetical latent space. Actors that are positioned close together in the latent space have a higher probability of interacting with each other frequently in a cooperative way, while actors positioned far away from each other are likely to interact in a conflictual manner. Latent space estimates for Greece in 2002, 2006, and 2010. Parties: PASOK (green), ND (blue), KKE (red). All other actors in gray.